Legend has it that long ago, hunger swept through the Native American tribes. As time passed slowly and food supplies dwindled, famine beckoned disease and death closer and closer. One day, a mother knelt in sorrow by the river, her children sick and dying. The Sun heard her cries of anguish and took pity on the mother, changing her tears to Bitterroot, that her people might never be hungry and sick again. The idea for this simple and elegant shawl came to me while looking over patterns in a stitch dictionary. I was struck by how much visual difference a small modification could produce. 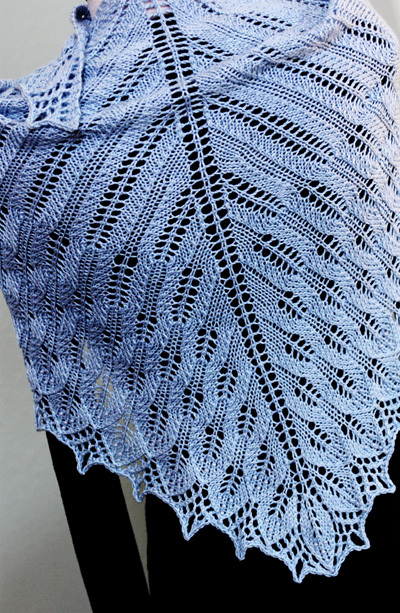 The lace patterns in this shawl morph seamlessly into one another and change merely by altering the placement of the decreases. 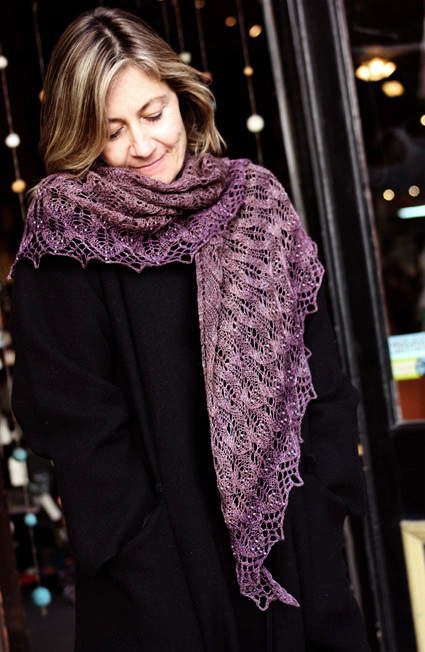 The "unvented" edging adds just the right amount of extra laciness for a perfect little shawlette to wear around your neck, or a lovely full sized shawl fit for a Sun goddess. 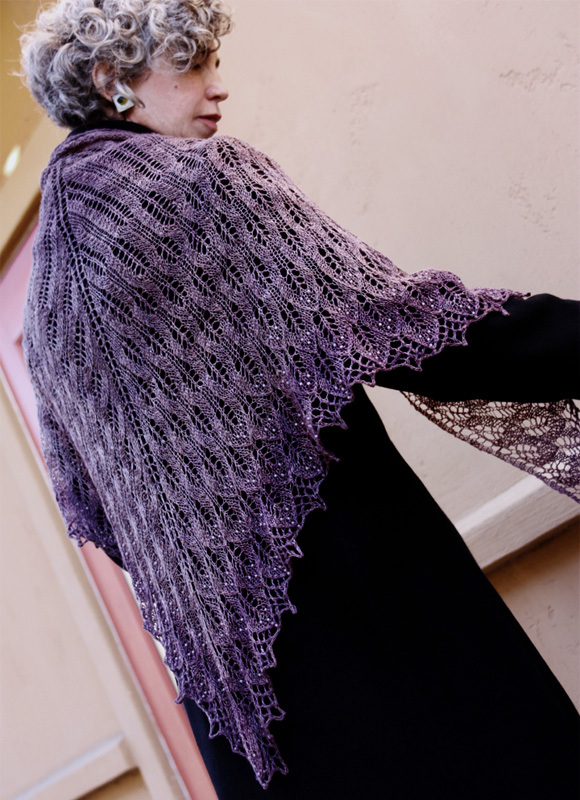 Note: The large/shawl shown was knit using lace weight handspun yarn. 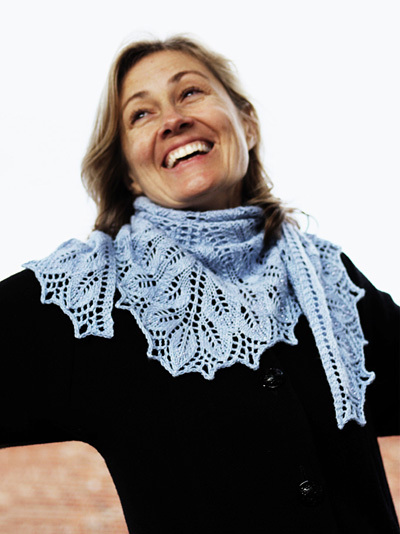 The small/shawlette was knit using commercially spun sport weight yarn. Note: to knit this version with commercial yarn, you will need approx. 750 yards of laceweight. Note: to knit this version with handspun yarn, you will need 450 yards at 18 wraps per inch. sk2p: Slip 1 knitwise, k2tog, pass slipped st over. 2 sts decreased. Placing Beads: Work stitch as shown on chart. Slip bead onto crochet hook, use crochet hook to lift st just worked off of right needle, slip bead down around st and replace st on right needle. Binding Off: When binding off for this project, work as follows: Work 2 sts in pattern, sl both sts back to left needle and k2tog tbl, [work next st in pattern, slip both sts from right needle back to left needle and k2tog tbl] until all sts have been bound off. Using waste yarn, CO 3 sts. Using working yarn, work 15 rows in garter st (k all sts); you will have 7 garter st ridges. At end of last row, do not turn work; rotate piece 90 degrees clockwise, pick up and k 7 sts (1 st for each garter st ridge) along side edge of piece; remove waste yarn from CO edge, placing resulting sts on needle, then k these sts. 13 sts. Set-up Row [RS]: K3, place marker, yo, k3, yo, place marker, k1, place marker, yo, k3, yo, place marker, k3. 17 sts. Next Row [WS]: K3, p to last 3 sts, k3. RS Rows: K3, slip marker, work chart row (odd-numbered row) to next marker, slip marker, k center st, slip marker, work chart row to last marker, slip marker, k3. 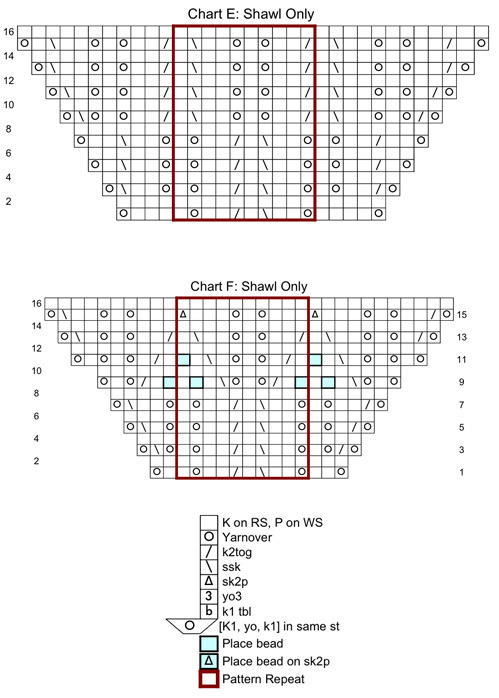 WS Rows: K3, slip marker, p to last 3 sts (even-numbered row of chart), slip marker, k3. Work Rows 1-8 of Chart A once, then work Rows 9-28 three times. 153 sts. Work Rows 1-20 of Chart B. 193 sts. 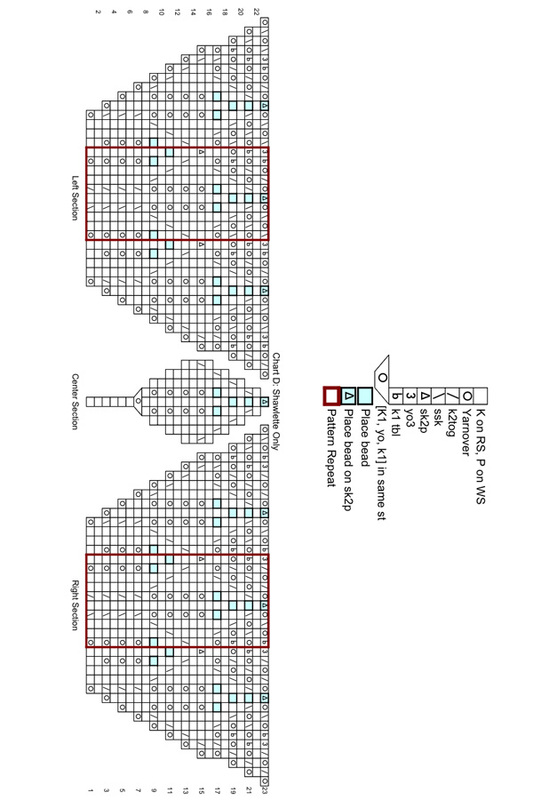 Work Rows 1-24 of Chart C. 241 sts. Work Rows 1-23 of Chart D, working each row as follows: k3, slip marker, work Right Section to next marker, working outlined Pattern Repeat 11 times; slip marker, work Center Section, slip marker; work Left Section, working outlined Pattern Repeat 11 times; slip marker, k3. Note that while on most rows the Right Section and Left Section are the same, they differ on Rows 19 and 23. When all rows of Chart D are complete, there will be 341 sts (each yo3 counts as 3 sts). BO all sts as described in Pattern Notes. When working into a yo3, k first yo, p second yo, k third yo. Work Rows 1-16 of Chart E. 273 sts. 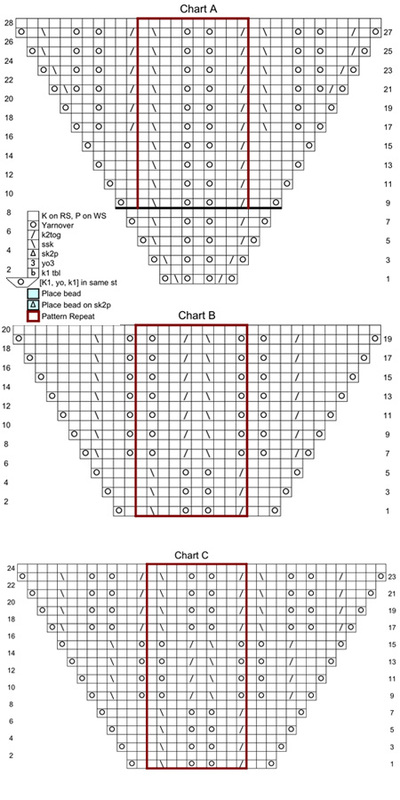 Work Rows 1-16 of Chart F. 309 sts. Work Rows 1-23 of Chart G, working each row as follows: k3, slip marker, work Right Section to next marker, working outlined Pattern Repeat 15 times; slip marker, work Center Section, slip marker; work Left Section, working outlined Pattern Repeat 15 times; slip marker, k3. Note that while on most rows the Right Section and Left Section are the same, they differ on Rows 19 and 23. When all rows of Chart G are complete, there will be 437 sts (each yo3 counts as 3 sts). Submerge thoroughly in water with a touch of wool wash. Squeeze excess water out and roll in a towel to dry further. If using blocking wires, thread wires through triple yarnovers. Pin out shawl, making sure to pin out triple yarnovers and center point of each beaded leaf. Measuring length and width of shawl as you shape and pin. Allow to dry thoroughly. For more information about wet blocking, see articles here and here. 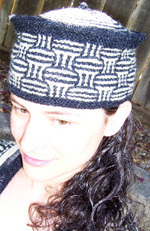 A regular contributor to Knitty, Rosemary (aka Romi) is the owner and founder of Designs by Romi, purveyor of shawl pins, sterling yarn ball jewelry and knitting patterns. Now that her book, Elements of Style: Knit & Crochet Jewelry with Wire, Fiber Felt and Beads (Interweave Press) is published, she's off and running with more knitwear designs and her new Pins & Lace Club. Romi lives in wine country with her three men, and when she's not designing, knitting or hammering, she can generally be found with them at swim practices and meets. She blogs here.